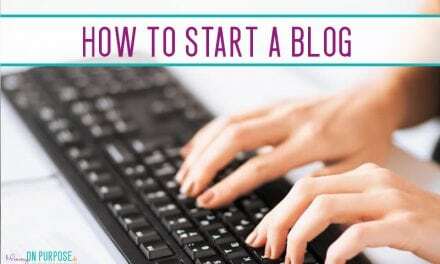 Starting a blog is a BIG learning curve. There is ALOT to be done, if you’re wanting to start it RIGHT (and avoid a bunch of headaches in the future.) 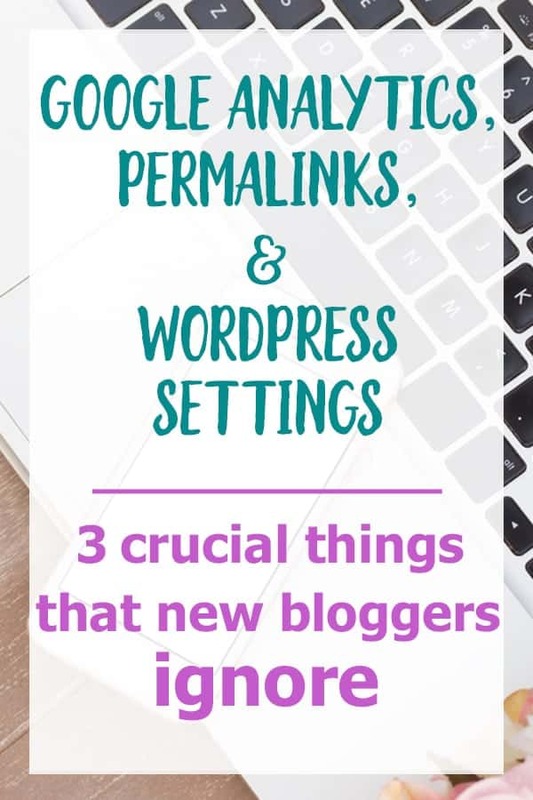 These three things we will tackle today are perhaps 3 of the things that come up THE MOST when I am talking to new bloggers. 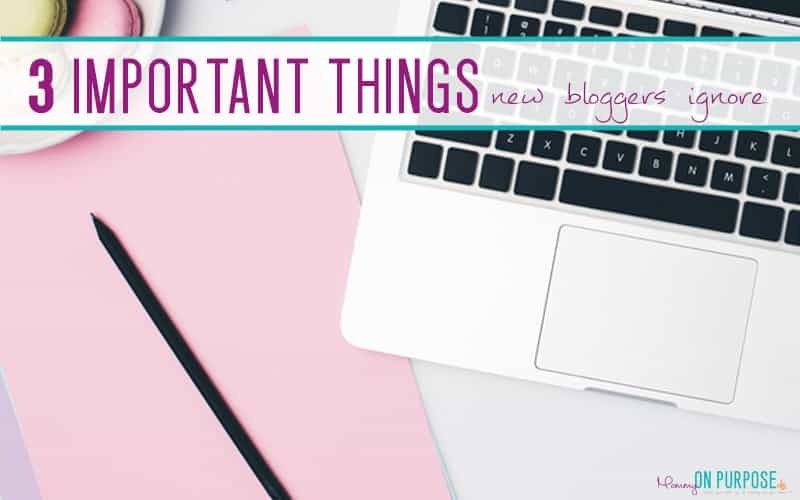 These three things will become part of your life today and remain part of your life for as long as you blog… so don’t let this stuff overwhelm you. 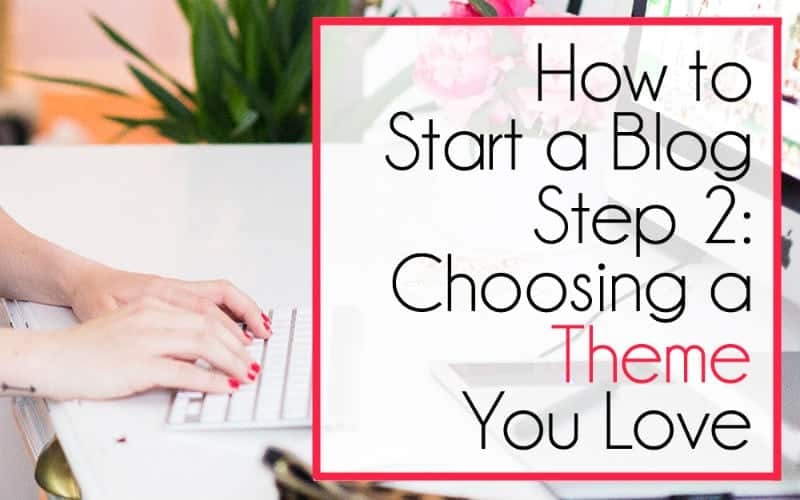 If you’ve set up hosting, and chosen a theme, and taken care of these 5 things to do before you write your first blog post – NOW is the time to tackle this picky technical stuff. You need to configure some WordPress settings (if you haven’t done so in tutorials). Your permalinks need your attention. And so does your Google Analytics. I am no WordPress wizard. And you don’t have to be either! But really really important thing number 1 on this list of “picky technical things” is configuring your WordPress settings. Doing this now will help you to get comfortable in your dashboard, but it will also make your whole blog look more professional from the get go. 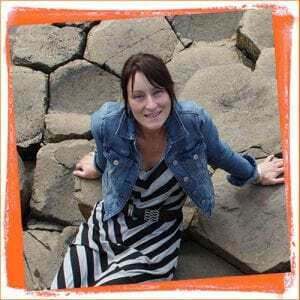 Melissa, from the White Corner Creative, is awesome at WordPress. I love her post 6 things to do immediately after installing WordPress. Go there. 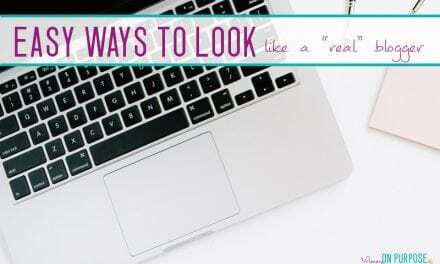 Read it and follow along with her while she tells you how to configure your general settings, your reading settings, your permalinks, your posts page, and your categories. These are simple things to do, and you will want them done! If creating a child theme just feels beyond you right now, put it on your list of things to look at later. It’s not AS important as permalinks or general settings. So, go configure your WordPress settings, ESPECIALLY THAT PERMALINKS THING SHE TALKS ABOUT, and I will be here waiting for you with really really important thing number 2. So what’s the big deal about permalinks? Sure, we can talk about that some more. You do not EVER want to have to change your permalinks in the future. You want to set ’em and forget ’em. For serious. 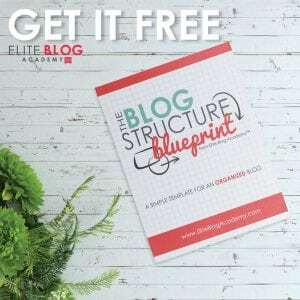 Because as you go along in your blogging career, you will connect those addresses to other posts, to link parties, to pinterest, to Facebook. Those addresses of your posts will be pasted all over. THEN in the future, if you decide you want not-ugly addresses, and you change your permalink structure, you will BREAK all the links that exist already out there online. They will lead no where because you will have changed them. Do you know when you click in from pinterest (or somewhere) and you end up at a “page not found” message? Or a page that says Error 404? THAT is what we create when we change permalinks down the line. You’ve maybe never heard of it, but this is about to become your new best friend. Google analytics shows you how many people visit your blog, and how long they stay, and what they read while they are there. 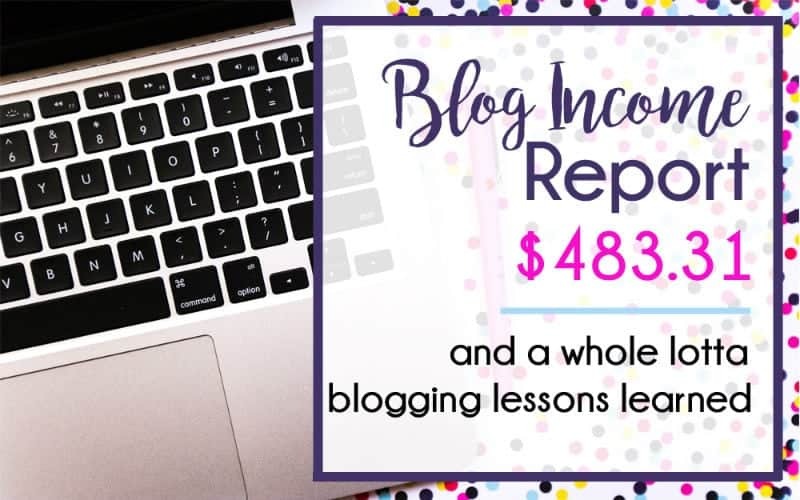 It will also show you what brought them to your blog, and as you try and grow your reach this information will be priceless to you. You will stare at it’s fluctuating numbers for hours on end. Set up of google analytics can be a bit intimidating, but you got this! You need to get a google analytics account from https://www.google.com/analytics. That part’s not hard. You’ll need to create a Google account (if you don’t already have one) and confirm it through the email they’ll send you. 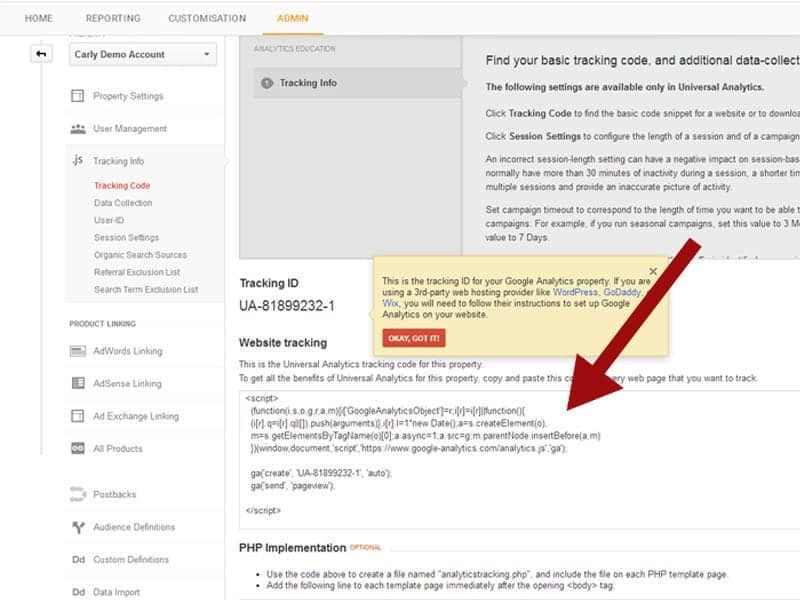 Head on over to watch this video tutorial on installing google analytics on wordpress from Mel at A Prettier Web. →First, create a google account and confirm it through the email they’ll send you. →Sign into google analytics with that account. → It will take you to a page where it asks for all your website info (not pictured.) Fill it all out and scroll to the bottom of that page, and click the “get tracking id” button. 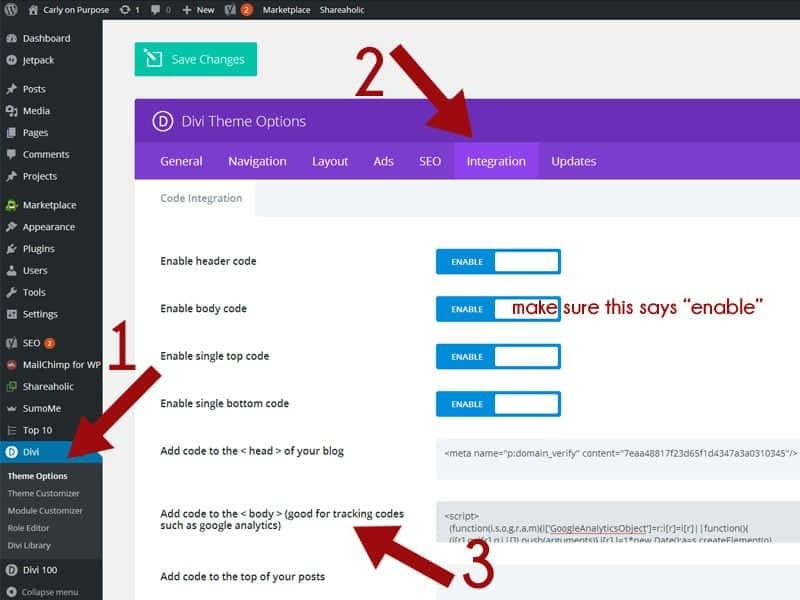 →Go to your WordPress dashboard and on the bottom left of your screen click “Divi – Theme Options”. Then Click Integration. Make sure “Enable body code” is ON, and paste the code to the box where it says “add code to the <body> of your blog. Once you have installed GA, make sure you exclude yourself from being read as “traffic” to your site. You don’t want to see yourself visiting your blog everyday and think that someone is reading it when it’s really just you. Here’s how to exclude internal traffic from GA. I believe that the only way to build a profitable blog without it would be by pure fluke. YAY! Well done, getting all this stuff done before you start blogging. I promise, you will not regret it! Thanks so much for mentioning The White Corner Creative in your post! What an informative read. Divi is definitely a great alternative! Hey Melissa 🙂 of course! You’re posts are great – I’m sure readers will benefit hugely from them! I’m SO computer challenged, Divi is almost my only option haha. Such great and useful info here, thanks Carly! So your Divi theme is both Parent and child theme, or just your child theme from Divi? I’m still trying to decipher where I will get a theme, the less complicated the better. Hi Gladys 🙂 Yes both my Parent theme and Child theme are Divi – Elegant Themes has a Divi child theme available to you (at no extra cost). It’s recommended that you use a child theme if you are going to be doing any customization whatsoever! (If you end up using Divi and want the link to the Child theme just let me know and I’ll send it to you, I find it hard to find over there at ET). I wouldn’t say that Divi is necessarily less complicated… I find it to be an EASIER complicated, if that makes sense LOL. There is none of this coding stuff to be done with Divi. THAT’s what I love about it! Plus I can customize it to be whatever I want it to be, without much help from anyone. So my site is unique, and I like that. I just got started through Siteground as you suggested and I am going through the checklist before I actually get started blogging. I got Divi as well because I am not good with computers. Anyway, I’m WordPress I have the free Jetpack that shows how many views and that type of info, would you suggest still getting google analytics? I would suggest ditching Jetpack and using GA only!! This post seriously saved my life! I had nooo idea how important permalink was until I started seeing pins with the word “permalink” but I would always skip through them until I landed on your pin! Thank you so much for being so informative! Thank you Carly! Your tips in this blog are amazing and I think that a lot of people make mistakes in their permalinks. Rebecca, I am not sure I understand your question! I recommend reaching out to WordPress or your host if you have questions about your permalinks! Good luck.